Mat Irvine reports: Firstly, the European side of Revell was saved, being taken over by Quantum Capital Partners, under the subsidiary Blitz. This also acquired all the assets of the US arm, Revell-Monogram (R-M), but not the premises. Consequently, the R-M building in Elk Grove Village, Illinois, was closed and the equipment there cleared. Much of the new tooling for kits issued in recent years had been passed over to Revell-Germany (R-G), but this still left a lot of older kit moulds. At this point, step in the Atlantis Model Company (logo below). Created and run by Peter Vetri and Rick DelFavero, Atlantis is a well-known name to Scale Model News readers, as we have featured a number of products over the years. Some of these were Revell reissues, so the connection was already there, and when the time came for Revell-Monogram to dispose of tooling, Atlantis was the obvious customer. “It's a lifelong dream to own this historic tooling and archive material related to these molds; to be able to preserve the tooling is a real honor. We look forward to reissuing many classics that have not been available in quite some time. All of the model kits will be made here in the USA and all the tooling and the Archive have been moved from Elk Grove to our facilities in Deer Park, NY. “I think model enthusiasts around the world will be pleasantly surprised in the coming years to see what the tooling bank and Historical Archive contains. Atlantis Hobbies first started as part of MegaHobby, and has always been based on Long Island, New York. It was separated out in 2009 as Atlantis Toy and Hobby by Pete Vetri and Rick DelFavero, with help and guidance from former Aurora Project Manager and highly knowledgeable kit historian, Andy Yanchus. Together they have a combined hobby experience of more than 60 years. This is brave move for what is after a small company, and SMN wishes them all the best in the coming years. Exactly what will be released has yet to be announced, but new releases are certain to interest modellers around the world. Mat Irvine (below left) seen on a visit to Atlantis in 2017. To the right, Pete Vetri, Rick DelFavero, Andy Yanchus. Rick, Andy and Pete (below) examine some Atlantis kits. Note the ex-Aurora 1:72 scale DC-9 jetliner on the edge of the cabinet. This was reviewed in SMN on August 10, 2017. Andy (below) examines a test-shot of an ex-Aurora animal, probably originated when he worked at Aurora. Georgy Liddle (below) looks into the display cabinet. Some are existing Atlantis kits, others could be future releases. Revell’s last premises (below) in Elk Grove Village, Illinois. 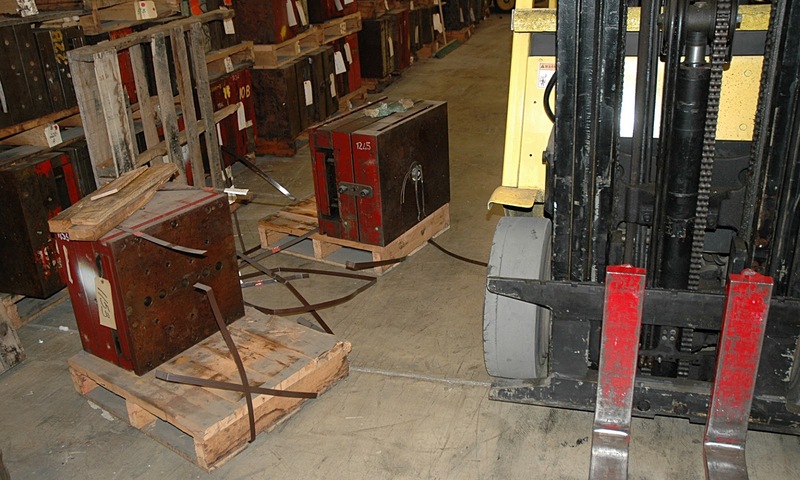 Some of the tooling (below) stored at the Elk Grove premises, though not necessarily acquired by Atlantis. The steel tooling for a model kit mould (below) is HEAVY! Hence a fork-lift truck is essential. Atlantis currently produces the American bison (below). Another existing Caribbean pirate figure (below). The Monument Valley UFO (below, header) is one of several Atlantis fantasy subjects.